About 100 members attended the Guild’s annual meeting at Newport. Isle of Wight, on July 1, and one of the more important points on the agenda of 22 items was that of arranging the festivities for the 1979 Centenary of the Winchester D.G. There is to be a dinner on April 28, a service of thanksgiving at Winchester Cathedral on Tuesday, June 26 the actual date of the founding of the Guild (and this will be part of the Cathedral’s own 9th centenary celebrations), and the centenary A.G.M. at Basingstoke (where the first meeting was held) on July 7. A committee to organise all these events and a centenary fund have been set up. Four of the seven districts have already contributed a total of £215.56 and a special issue of the Ringing World will be printed in June, 1979. Centenary mugs with special impressed insignias will be on sale, and many other meetings and social events in the districts are being planned. Photographs and articles of historical interest are being sought, particularly of officers and members in the earlier days of the Guild. The meeting on July 1 was held in Unity Hall, opposite Newport parish church, and the Master (Mr. Kenneth Croft) presided and opened with prayer. He welcomed several visitors from afar and also Dr. J. B. Williamson of Ventnor, who at 85 is the senior member of Cambridge U.G. and a former chairman of the Isle of Wight District. A good-will message was sent to Roy le Marechal following his accident (Roy is peal recorder) and the meeting stood silently remembering Joan Salmons, Ronald Marlow, Ernest Senior and Mervyn Palmer. The minutes, previously circulated, were approved and it was stated that a bell from the redundant church of Holy Trinity, Bournemouth, had been given to Eling. The fine ring of eight at Privett, where the church is to be converted into a private residence, was not to be split up but would remain the property of the Diocese. It was possible that the eight bells would remain and perhaps be occasionally rung. The newly - appointed librarian (Mrs. Philippa Nabb) gave a comprehensive report on her first year’s work. She has joined the local art college and taken up bookbinding in order to repair many of the books which have become dilapidated over the years. Several of these repaired volumes were on display and are very well done. Mrs. Nabb has also prepared and collated many old letters, articles, photographs, etc., into scrap books, which will be invaluable for future generations. Assembly point before the business meeting was at Newport Parish Church. Many were in the tower; others, however, preferred to chat outside. The new rules for the library were read out and approved, and a £50 “float” for use by the librarian was agreed, it being stated that the library fund was to be implemented in various ways. The 6-bell and 8-bell striking competition dates are to be transposed and the Guild’s Ringing School is to continue with a course on October 7. The recent Central Council meeting at Guildford was reported upon by Robert Cater and given in a most interesting and informative manner. Thanks were extended to the organisers of last year’s social gathering at Southsea (which made a profit!) and congratulations extended to Mr. Edwin Cole, Mrs. Marcia Marshallsay, Mr. H. Harrison, Mr. A. H. Mitchell and Mr. Wm. Freeman, who completed 50 years’ membership and were elected hon. life members. Mr. Roger Savory, who had served many years as Guild secretary and then as Master, was also elected to hon. life membership, on the proposition of the chairman (for the executive committee). Roger is at present resident in America and had sent good wishes to the meeting. Mr. Alan Buswell offered to present in 1979 a Centenary Shield for competition, for the tower that rang the most quarter peals. Whilst the generosity of the donor was acknowledged, there was considerable discussion and some opposition to the proposal, various difficulties and problems being voiced. The proposed rules governing the composition were read out, one being that the quarters were to be published in the Ringing World. The editor was asked to give his opinion and stated that the competition must be entirely within the Guild, for whilst many quarters would no doubt be published, no guarantee could be given that all would appear. Many suggestions, proposals and amendments were voiced and eventually it was agreed that the executive committee first should look into the pros and cons and approve the rules before accepting the trophy for quarter peal ringing. There were three amendments to rules, two of which were accepted without debate. However, the third - to raise the peal fees from 5p to 10p - again brought a considerable division of opinion. Mr. Green proposed 5p be raised to 15p, of which 10p would go to the Bells Restoration Fund, and after many propositions, counter-propositions and amendments, this was finally agreed, but not before the chairman had almost given up trying to find a way out of the impasse into which the members had driven themselves. The Master (Mr. Ken Croft) congratulates Mr. H. A. 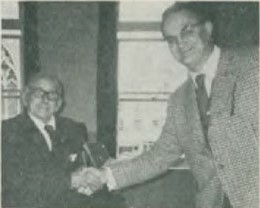 (Bert) Mitchell of Bournemouth (left) on his election as hon. life member of the Guild after 50 years’ membership. 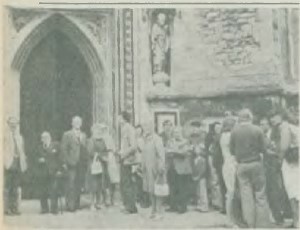 With four minutes to go before the service was due to take place, any other business was called for, and Mr. Arthur Davies gave an impassioned appeal for ringers to consider again their responsibility to the Church and for Sunday service ringing. He compared the present day with those of 100 years ago and congratulated the Guild on its progress. After thanks had been given to the chairman, the company adjourned for service and tea, the latter being in the Village Hall, Carisbrooke, prepared and served by local ringers and members of the Isle of Wight District. A social evening and dance were also enjoyed, and members who were forced to leave early to return to the mainland were sad to miss so much fun. The Master (Ken Croft), after the various reports were presented, expressed thanks to each individual officer for services rendered. He particularly complimented Philippa Nabb on her enthusiasm and keenness as librarian. “Who else would join an art college and learn bookbinding (at their own expense) for the benefit of the Guild?” he asked, amidst applause for “Pip” Nabb. Mark Esbester, who was mainly responsible for the increase in the peal fees, had just made a declaration of agreement with 15p when one of the church bells nearby tolled. “For whom the bell tolls; it tolls for thee”, quoted one wit, amidst laughter. There were several differences of opinion between Mrs. Madeline Croft and the chairman (her husband) and Mr. Bill Croft and the chairman (his father) over proposals and counter-proposals regarding the quarters competition and the increase in peal fees and how to divide it. Bill Croft wanted any handbell peals to cost only 10p as the ringers did not use the bells or ropes in a tower. However, upon being put to the vote this was defeated. The meeting decided to donate £10 to Lyndhurst, where £70 had been spent on repairs, these being carried out by the local ringers; and £10 to Hursley, where £70 had also been spent. At Upham there was a £10,000 restoration mooted, and the Guild will give £500 subject to the work being satisfactory. The Guild Bells Fund stands at £3,940, it was stated by the treasurer. Coach tours of the Island had been organised and these proved most successful. Among the tourists were ringers from the Channel Islands who received a special welcome.